Pituitary apoplexy is a rare endocrine emergency that occurs in a small number of patients with a pituitary tumor. It is a clinical syndrome characterized by the sudden onset of headache, nausea, vomiting, visual impairment, and decreased consciousness, caused by hemorrhage and/or infarction of the pituitary gland. Pituitary apoplexy has very rarely been described during pregnancy, when it is potentially life-threatening to both the mother and the fetus, if unrecognized. Only a few cases have been published to date. The review of the existing literature underlines that pituitary apoplexy, although rare, should be borne in mind when a pregnant woman presents with severe headache and visual defects of sudden onset. After initial management, which includes intravenous glucocorticoid therapy, fluid and electrolyte replacement, the final selection of medical or surgical treatment should result from a multidisciplinary approach involving expert specialists, keeping into account both severity of clinical presentation and gestational week. Additional case report: A 27-year-old Caucasian woman with no history of pituitary adenoma was admitted at the 35th week of her first pregnancy because of severe fronto-orbital headache, photophobia, and blurring of vision of sudden onset. Neuroophthalmological examination showed deterioration of visual acuity (5/10 in right eye, 2/10 in left eye), with a generalized and bilateral visual field defect compatible with compression of the optic chiasm, evolving in bilateral narrowing of sight within few hours. MRI revealed an intra- and extrasellar mass, with suprasellar extension and compression of the optic chiasm, deviation of the pituitary stalk, and fluid levels at T1-weighted image consistent with recent bleeding (Fig. 1). Neurosurgery was postponed after delivery, and an urgent cesarean section was performed; Delivery was uneventful, and a healthy son of 3350 g was born. The day after delivery, the pituitary lesion was successfully removed via endonasal endoscopic transsphenoidal surgery. Histologically hemorrhagic material and necrotic changes were shown, compatible with the diagnosis of pituitary adenoma apoplexy. In the next few days, there was a marked improvement of visual field and visual disturbances. Laboratory testing after surgery showed central hypothyroidism and mild hyperprolactinemia. A repeat MRI after 4 months showed total removal of the adenoma, no tumor regrowth, and persistence of pituitary stalk deviation (Fig. 1). 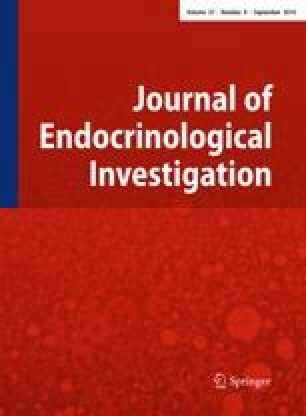 Nine months after surgery, hormonal reassessment revealed a normal cortisol secretive response, allowing glucocorticoid withdrawal, confirmed central hypothyroidism requiring replacement therapy, and a normal GH response; because the patient had central hypogonadism due to persistent hyperprolactinemia, cabergoline therapy was started, with restoration of normal prolactin concentration and regular menstrual periods.